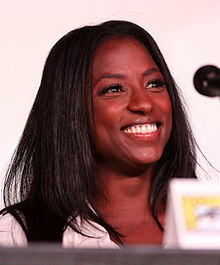 Rutina Wesley (born December 21, 1978) is an American actress. She is best known for her roles as Tara Thornton on the HBO television series True Blood and Nova Bordelon on the OWN television series Queen Sugar. Wesley was born and raised in Las Vegas, Nevada. Her father, Ivery Wheeler, is a professional tap dancer, and her mother, Cassandra Wesley, was a showgirl. She attended high school at the Las Vegas Academy of International Studies, Performing and Visual Arts. She studied dance at Simba Studios and the West Las Vegas Arts Center. While at the Las Vegas Academy, Wesley missed several other auditions for college training programs and was finally accepted by the University of Evansville in Indiana. She was hesitant in joining the university because of a lack of minorities in the state. After earning her Bachelor of Fine Arts in Theatre Performance in 2001, her grandmother suggested that she do a nursing course, but Wesley insisted on pursuing her artistic education. She joined the Juilliard School in 2001 and graduated in May 2005 (Group 34), which included a summer spent at the Royal Academy of Dramatic Art. At Juilliard, she became close friends with her future co-star Nelsan Ellis (Group 33: 2000–2004). 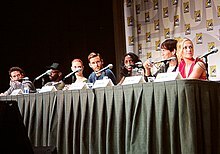 Wesley is at the International Comic-Con San Diego with Ryan Kwanten, Deborah Ann Woll, Anna Paquin, Stephen Moyer, and Nelsan Ellis on this TV shows of True Blood in 2011. In December 2006, Wesley was featured in David Hare's Broadway play The Vertical Hour. In 2007, Wesley also appeared in The Public Theater production of In Darfur by playwright Winter Miller, co-starring Heather Raffo and Aaron Lohr, among others. Wesley had a minor role in the 2005 film Hitch, which was edited out in the final cut. In 2007, she made her on-screen debut as the main character in the film How She Move, from British director Ian Iqbal Rashid. The character Raya Green, who enters a step-dancing competition to secure funds for her education, was inspired by Tony Manero, portrayed by John Travolta in Saturday Night Fever. Prior to the shooting of the film, Wesley underwent a five-week dance rehearsal period. Portraying a woman of Jamaican descent, she also took dialect coaching for the role. Wesley auditioned for the role Tara Thornton in the HBO series True Blood in 2007 and secured the part after creator Alan Ball chose her because "[she] was the first person who showed [Tara's] vulnerable side". In January 2015, it was announced that Wesley had been cast in a recurring role on the NBC drama series Hannibal. She portrayed Reba McClane, "a blind woman who enters into a relationship with Francis Dolarhyde (Richard Armitage), and helps soothe his murderous urges—at least at first." Wesley appeared as Liza Warner in the fourth season of Arrow. In 2016, Wesley was cast as lead character in the Oprah Winfrey Network drama series Queen Sugar, produced by Ava DuVernay and Oprah Winfrey. Wesley divides her time between Los Angeles and Astoria, Queens. In 2005, she married her former Juilliard classmate Jacob Fishel, an actor. Wesley filed for divorce on August 16, 2013, citing irreconcilable differences. In November 2017, Wesley announced her engagement to Shonda, a female chef from New Orleans. 2008 Numb3rs Sarah / Jenny Calandro "Magic Show"
2009 The Cleveland Show Yvette (voice) "Ladies' Night"
2010 True Blood: Webisodes Tara Thornton "Sookie, Tara & Lafayette"
2010 Generator Rex Providence Cadet Kenwyn Jones (voice) "Basic"
2011 Generator Rex Providence Agent Kenwyn Jones (voice) "Lost Weekend"
2011 Bandwagon: The Series Auditioner "It's Your One Shot"
2012 True Blood: Jessica's Blog Tara Thornton "Big Vampire Sisters"
2012 The Cleveland Show Tori (voice) "Frapp Attack"
2015, 2017 Arrow Liza Warner/Lady Cop Episodes: "Beyond Redemption" and "The Sin-Eater"
2019 The Walking Dead Jocelyn Episode: "Scars"
^ "Correction To Rutina Wesley's Birthday Post". trueblood-online.com. trueblood-online.com. Retrieved March 1, 2015. ^ a b c Williams, Kam (January 20, 2008). "Rutina Wesley "How She Move" Interview with Kam Williams". News Blaze. Retrieved April 14, 2009. ^ a b c Rochlin, Margy (October 30, 2008). "Flesh and Blood in a Town of Vampires". The New York Times. Retrieved April 14, 2009. ^ Staff, Hollywood.com (February 6, 2015). "Rutina Wesley | Biography and Filmography | 1979". Hollywood.com. Retrieved July 21, 2017. ^ a b c Cling, Carol (January 29, 2008). "Las Vegas Academy grad a shooting star". Las Vegas Review Journal. Retrieved April 14, 2009. ^ a b "Spotlight: Training to Act". Back Stage. Nielsen Business Media Inc. January 17, 2007. Archived from the original on September 30, 2007. Retrieved April 14, 2009. ^ "Rutina Wesley". Biography.com. Retrieved April 6, 2012. ^ "Q&A With Rutina Wesley". Alumni News. The Juilliard School. May 2010. Archived from the original on November 11, 2011. Retrieved April 6, 2012. ^ "How She Make a Movie: Rutina Wesley on Auditions, Epsom Salts, and Belief in Self". The Juilliard Journal. The Juilliard School. March 2008. Archived from the original on March 16, 2012. Retrieved April 6, 2012. ^ "Interview with Rutina Wesley". myFanbase. February 19, 2010. Retrieved March 1, 2010. ^ "Alumni News". The Juilliard School. May 2008. Archived from the original on November 11, 2011. Retrieved April 6, 2012. ^ Pincus-Roth, Zachary (April 11, 2007). "Public's in Darfur to Star Raffo, Lohr, Washington, Wesley, Jah". Playbill. Archived from the original on September 9, 2012. Retrieved April 14, 2009. ^ Marchand, Philip (January 24, 2008). "'How She Move' shows dance as escape". TheStar.com. Toronto Star Inc. Retrieved April 14, 2009. ^ Prudom, Laura. "'Hannibal' Casts Rutina Wesley as 'Red Dragon's' Reba McClane". Variety. Variety. Retrieved January 24, 2015. ^ Otterson, Joe; Sneider, Jeff. "'True Blood' Alum Rutina Wesley in Talks to Join 'Arrow' for Multi-Episode Arc (Exclusive)". The Wrap. Retrieved August 11, 2015. ^ "'Arrow' scoop: Get details on Rutina Wesley's role - EW.com". Retrieved January 13, 2016. ^ Nellie Andreeva. "Rutina Wesley To Star In OWN Drama Series 'Queen Sugar' - Deadline". Deadline Hollywood. Retrieved January 13, 2016. ^ "Rutina Wesley Divorcing Jacob Fishel". People.com. August 20, 2013. ^ Gilchrist, Tracy E. (November 20, 2017). "True Blood's Rutina Wesley Comes Out in Heartfelt Instagram Engagement Post". Retrieved November 21, 2017. This page is based on the Wikipedia article Rutina Wesley; it is used under the Creative Commons Attribution-ShareAlike 3.0 Unported License (CC-BY-SA). You may redistribute it, verbatim or modified, providing that you comply with the terms of the CC-BY-SA.